Mirror, Mirror On The Wall - Which Princess are you most like? Snow White Returns - Newly discovered storyboards. Was Walt planning a Snow White sequel? Why do I mention these here at the beginning of the review instead of at the end like normal? Because these are all on the second Blu-ray disc, not on the DVD, and since I do not yet have a Blu-ray player, I can not yet watch them. The only extra features on the DVD, besides the typical previews (which hardly count), are a sneak peak at The Princess And The Frog (which is worth mentioning because the preview is like seven minutes long), a music video by Tiffany Thornton, and a feature length commentary by Walt Disney, which is pretty amazing when you think about it since the guy passed away long before DVD commentaries ever existed. Next I'd like to mention the packaging. There are two different versions, one a Blu-ray case and one a DVD case, and each has different cover art. The Blu-ray case features the old witch with her bright red poison apple front and center with smaller picture of Snow White directly underneath. 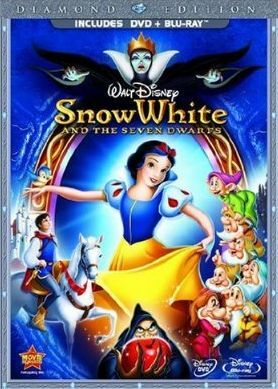 The DVD case switches the two, putting a larger Snow White front and center, which is the version I have and I personally think it looks much better. The outer cardboard protector has various foil embossing in different areas with different colors which just ends up making the thing look beautiful.